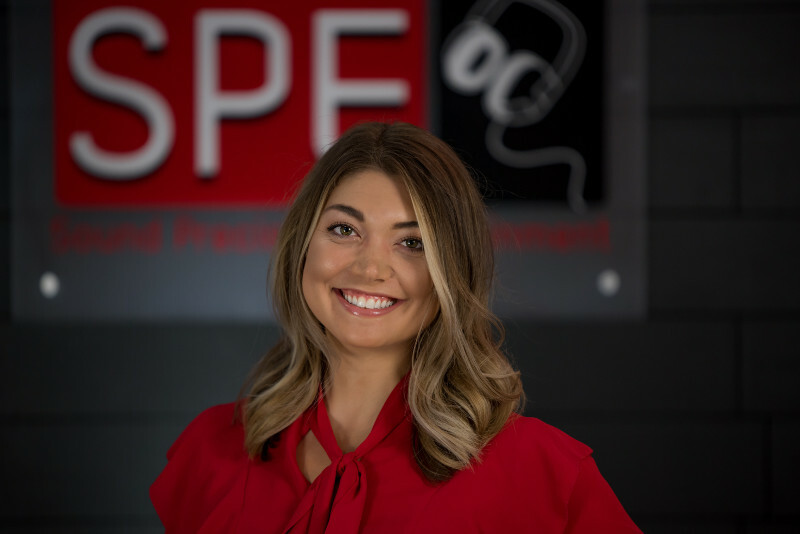 Chelsea Foster is not only Sound Precision Entertainment’s newest employee – she also marks a milestone in the company’s history. Foster is the first female lead DJ to work for SPE, and we couldn’t be more proud. Our company is committed to diversity, and we are excited to hire such a talented, professional woman to join our ranks. Foster actually came to SPE through a chance meeting with SPE Owner Scott Terranova. Born in Iowa, Foster moved to Ohio at age 2 and grew up in the city of Alliance. She graduated from Ohio University in 2016 with a master’s degree in public administration. Prior to that, she earned a bachelor’s degree in sociology and prelaw. Foster now lives in Shaker Heights and works full time as a human resources generalist. However, Foster has also fully embraced the term “side hustle.” In addition to her 9-to5 job, she also works in the morning and evenings as a cycling instructor at CycleBar, a fitness coach at Orangetheory Fitness and now SPE. “I love each and every one my jobs, and not one of them feels like work!” she said. With SPE, so far her favorite part of the job is being a part of her clients’ most memorable moments. “I love that I have the opportunity to witness firsthand the joy and love that comes to life on these special days and am able to to contribute to making their big day extra special,” she said. She loves to pump up a crowd by picking a song that everyone knows and getting out on the dance floor to get the party started. Foster is no stranger to weddings as she has previously worked in the catering industry, and her older sister recently got married. When Foster isn’t working, she enjoys being active outdoors. “I am also notorious for the occasional last-minute plans for a night out in The Flats, Ohio City or anywhere with some good music to dance to!” she said. What is your favorite place to go in Cleveland and why? Currently, I am in love with going on long bike rides and exploring the hidden gems in this area. My favorite is to pick a back road and see where it takes me. For a more specific location, Edgewater Park or any of the rooftop bars … I am a sucker for good views. Honestly, life in general inspires me. I really try to live a life with eyes wide open. I definitely have goals and plans and like structure, but the fact that there is so much to accomplish, try and learn inspires me each and every day. What is your favorite song to play at events? Fresh chips, table-side guacamole, pico and a good margarita!